What Is Holding Back Data Analytics? The McKinsey Global Institute recently published some new analysis on the uptake of data science in various segments of the economy. The bottom line is that much of the potential for the application of data science (big data and data analytics) has not been captured, to date. 86% of executives surveyed said their organizations were ‘only somewhat effective at meeting the goals they set out for their data and analytics initiatives’. In a companion Harvard Business Review article, McKinsey researchers Nicolaus Henke, Jacques Bughin, and Michael Chui went further than just reporting the numbers. They dug into the factors that seem to help or hinder the adoption of data science in the business context. One aspect of this was surveying more than 500 executives, across a broad range of industries: 86% of executives surveyed said their organizations were ‘only somewhat effective at meeting the goals they set out for their data and analytics initiatives’. So, organizations might be laying out the game plan for a company-wide adoption of data science, but somewhere along the way they fall short. Not moving from experiments to a new operating model of the business — Trying a narrow, small-scale data science initiative, even when it is effective, does not naturally lead to the diffusion of new thinking and practices across the company. Buying a few tools and fiddling with them is not going to do much. Perhaps the company doesn’t have enough data to actually scale the experiments up, which suggests a lack of investment in digital transformation. Not working strategically — The company needs a strategic vision, which spells out in detail how data science will create new value, and how it will be measured. Not acquiring the right capabilities — The right people and tools are critical, and while it’s possible to outsource some of the work it’s essential to have knowledgeable ‘business translators’, who can ask the right questions that get at key business problems. 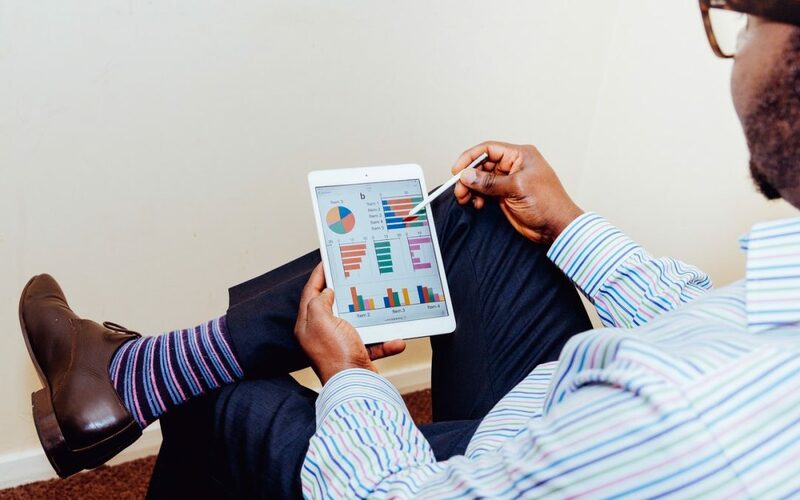 In McKinsey’s latest survey on digitization, 38 percent of respondents said their CEOs were leading the digital agenda for their companies; in this survey, just one-quarter say their CEOs lead the data and analytics agenda. But even when analytics are top of mind for company leaders, many of them don’t seem to be communicating a clear vision throughout their organizations. 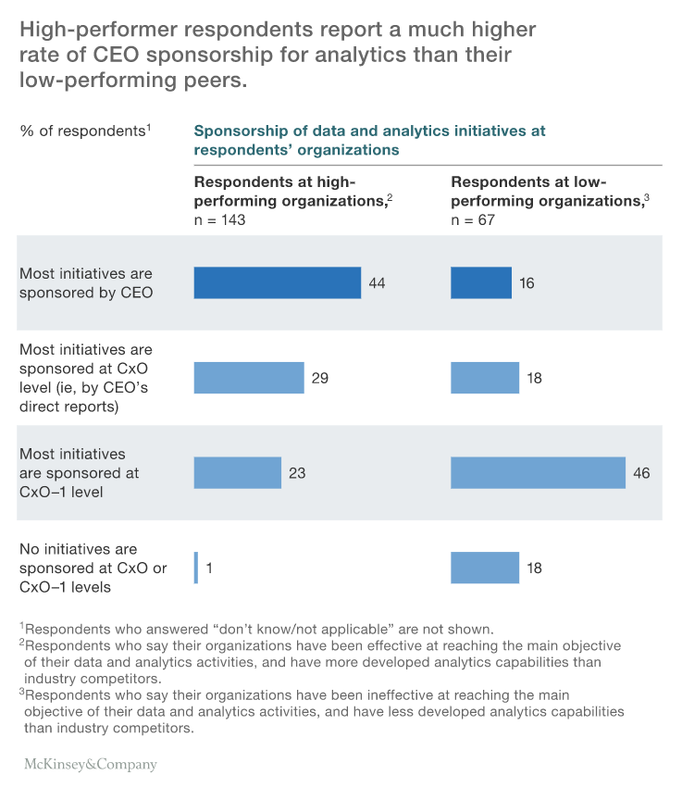 Thirty-eight percent of CEOs say they lead their companies’ analytics agendas, but only 9 percent of all other C-suite executives agree. These respondents are much more likely to cite chief information officers or business-unit heads as leaders of the analytics agenda. In this case, ‘high-performing’ companies are ones that have been ‘somewhat or very effective’ in reaching their data and analysis activities, and that report a greater impact on total revenue (as much as 3%) than lower-performing companies. It’s clear, then, what is holding back gaining the advantage that data science offers: lack of strategic alignment. When senior executives lay out a strategic vision of data and analytics and then execute it — making the right investments, working on areas of real value, and measuring results against agreed upon metrics — they are much more likely to gain the latent benefits of data science.